A biomass boiler is like the standard gas and oil boilers you find in most homes, but it is fuelled by solid biomass rather than gas or oil. For that reason, it’s noticeably bigger and demands more maintenance. Biomass is biological material that comes from plants or plant-based organisms. When it comes to domestic boilers this material is usually wood logs, chips or pellets. Most boilers burn fossil fuels like gas and oil to produce heat. While effective, the process emits carbon dioxide into the atmosphere which is one of the main causes of global warming. Put very (very) simply, a layer of carbon dioxide around the earth is stopping heat from escaping our atmosphere and is gradually heating up the planet. Burning wood, on the other hand, is a carbon neutral process which means it only produces as much carbon dioxide as the tree absorbed while it was growing, cancelling itself out. As a naturally occurring fuel like coal it is much more sustainable. Unlike coal, wood does not take millions of years to form. In addition, UK landfill sites take in millions of tonnes of waste wood every year. This means that using wood as fuel is not only healthier for the planet’s atmosphere but will also take the strain off our landfill. As a standard boiler burns gas or oil, a biomass boiler burns the wood logs/pellets/chips in order to heat the water that supplies your radiators, baths, taps etc. A modern biomass boiler has a fuel storage compartment which will automatically feed the wood chips/pellets into the combustion area to be set alight by a probe. As the fuel burns it heats the water via a heat exchanger. While gas boilers have a constant fuel supply from the gas network and an oil boiler is supplied by a large tanker, a biomass boiler’s fuel needs to be topped up either by hand or by an automatic mechanism called a hopper. A hopper stores a greater volume of fuel and will automatically refuel the boiler as needed, reducing your workload. As it burns solid fuel, a biomass boiler needs to be manually emptied of ash and cleaned every now and again. Depending on the type of boiler you have and the technology involved this could be once a week or once a year. A biomass boiler can achieve energy efficiency of 89 – 91% which is equal to the high efficiency gas and oil boilers on the market. Remember: A biomass boiler is still capable of producing carbon monoxide so make sure you have a detector installed. What types of biomass fuel are there? 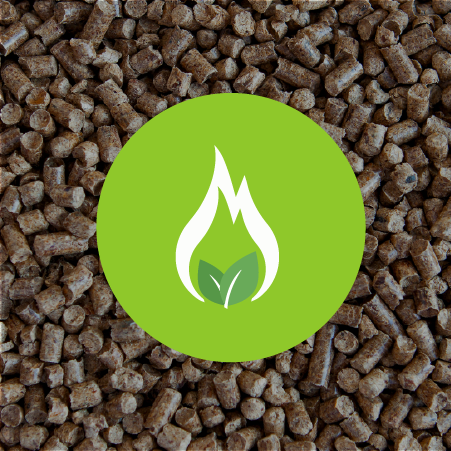 There are three types of fuel that can be used in biomass boilers: pellets, chips or logs. Sawdust and wood shavings are compacted into small pellets. They are easier to transport and store than wood chips or logs because of their small size and low moisture content of around 8%. They are the most popular fuel for biomass boilers as their uniform size means they can be automatically fed from storage to be burnt through a hopper, reducing the manual input needed. They are more efficient than chips or logs as they have a higher calorific content. Wood chips are logs that have been fed through wood chipping machines; they are cheaper to buy than wood pellets because they are simpler to produce. Despite their lower price, they are not necessarily the best choice for a domestic boiler. This is because they take up much more physical space and have a higher moisture content than wood pellets (25% so are less efficient. The bulkier size increases the cost of transportation and means they are more difficult to store. Some biomass boilers (but not all) can be fueled with logs. This is an attractive option for those who have access to waste wood at home or nearby as it means you greatly reduce – or remove – fuel costs. However, there are downsides to using logs. Firstly, they have very high moisture content (25%) and deliver relatively little energy when compared to wood pellets. For so little energy efficiency, they take up a lot of storage space and are harder to transport. Also, logs usually need to dry out for a long time before they can be burnt or they produce smoke and tar. This means you would need storage capacity that is both big and dry enough to store wood for the future as well as wood to be used now. Finally, wood logs cannot be automatically fed into a boiler by a hopper so you will be responsible for refuelling by hand. What does a biomass boiler cost? Biomass fuel is cheaper per kWh than gas, oil and electricity, especially if you have access to free logs. So depending on what you spend on energy bills at the moment you could make a significant saving. It’s also important to note that biomass fuel is not subject to the import price fluctuations associated with gas and oil. When you consider that gas prices are rising by 10% every year this is a significant advantage. When buying biomass fuel it makes economic sense to order in large quantities (e.g. a year’s supply) to avoid the hassle and expense of regular top ups. A potential problem with this, however, is that you may not have enough space to store the fuel at your home. You may need to order in smaller quantities a few times a year which will increase your costs. If this is the case you need to check that there is a supplier in your local area to keep delivery costs at a minimum. The UK government wants to increase our use of renewable fuels, including biomass, by 12% by 2020. To encourage us to do so, and to make the high installation costs of biomass boilers more manageable in the long term, they introduced the Renewable Heat Incentive (RHI) in 2014. If your biomass boiler is MCS accredited and installed by an MCS accredited engineer, the government will pay you 4.21p* for every kilowatt-hour of heating that your home requires (up to maximum of 25,000kWh). This figure is estimated based on the Energy Performance Certificate (EPC) which your property should already have. You receive quarterly payments every year for 7 years.